I’ve always been hesitant to bake bread, as my brief attempts in the past have resulted in a mess and something resembling concrete, but I believe that change is in the air. The Food Hunter, recently recommended a new cookbook, Make Ahead Bread, by food blogger Donna Currie, which features 100 recipes for melt-in-your-mouth fresh bread every day. My averse feelings to baking quickly faded when I opened the book and saw that the first chapter is dedicated to explaining terms and methods on kneading and includes a basic recipe for a sourdough starter. Make Ahead Bread is so comprehensive and easy to follow that tying to decide what to bake first became the hardest task. Garlic Knots, Butter Buns, Jalapeno and Roasted Red Pepper Cornbread – the recipes include everything from loafs and pastries to flat breads and even a few gluten free options. 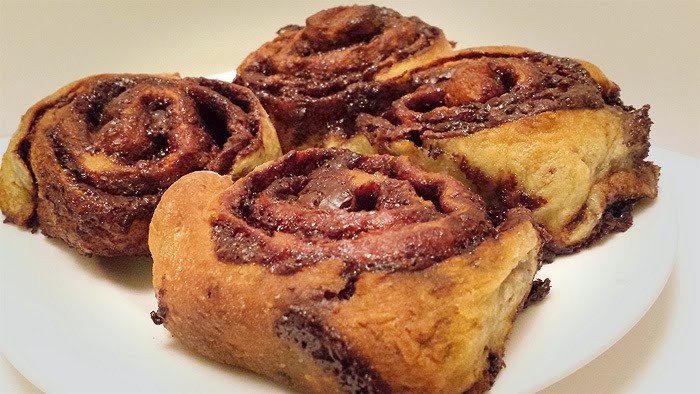 I decided to satisfy my sweet tooth first and prepared the most delicious, Nutella Swirl Rolls. Similar to your basic cinnamon roll but featuring the delightful flavor of hazelnut, it's impossible to eat just one. A challenge for me was finding hazelnut meal in the grocery store, so I opted for a passable substitute, grinding down sunflower seeds, which added just the right texture to the dough. I was very impressed with this cookbook and appreciate the extra chapters dedicated to teaching techniques, as well as the measuring equivalents and index. I can honestly say I am looking forward to baking bread, this holiday season with Make Ahead Bread. For those that don't know Donna Currie is also part of the Virtual Potluck, a cool group of bloggers that met several years ago during an Emeril cookbook campaign. The group has come together to support Donna and her new cookbook and have some amazing prizes to give away. See contest details below and be sure to enter for a chance to win. Donna's Book, Make Ahead Bread, is available for sale on Amazon. If you'd like an autographed copy, you can order one from Barbed Wire Books. 1. Combine the water, yeast, flour, sugar, salt, and hazelnut meal and knead by hand (mix first in a large bowl, then turn out and knead) or in a stand mixer fitted with the dough hook until the dough is elastic. 2. Cover the bowl with plastic wrap and let the dough rise until it has doubled in size, about 1 hut in a warm room. 3. Spray a 9 x 13-inch baking pan with baking spray. 4. When the dough has risen, flour your work surface and turn out the dough. Pat it into a rough square shape, then use a rolling pin to roll it to about 16 x 24 inches. 5. Spread the Nutella on the dough in as even a layer as possible. It's easiest to dollop on the Nutella, then spread it in that area rather than trying to spread it all from one large blob. Leave about an inch of the dough uncovered on one of the short ends. 6. Starting at the short end with the Nutella spread to the edge, roll the dough jellyroll style, leaving it a bit loose. 7. Cut the roll into 12 even pieces and arrange them, flat side up, in the prepared baking pan. Cover the pan with plastic wrap or place the whole pan in a large plastic bag and tie the open end closed. Refrigerate overnight or up to 24 hours. 1. Take the pan out of the refrigerator and heat the oven to 325 F.
195 F (make sure the thermometer is in the dough, not the filling). let the buns cool in the pan for 10 minutes, then transfer them to a wire rack and let cool. A special thanks to Taunton Press, Silverstone, Microplane and WÜSTHOF for supplying products for the giveaway. Great to work with you and Virtual Potluck again! Glad to see you made this recipe! I'm going to try it when my son returns from studying in France this month. He loves Nutella. Happy Holidays! How amazing were these rolls? I made them ahead of time, froze them and then served them to my house full of company for breakfast on Thanksgiving. They were a huge hit! Nutella is like an elixir from the gods, especially baked in rolls or croissants. Yum. That looks so delicious. I bet my Nana would love that. My favorite bread is definitely the french baguette! Yum. I could eat that forever! My favorite bread is cinnamon raisin by far! My current favorite is a no knead sourdough with cranberries and lemon zest. My favorite is Potato Bread, when I make it my son Jimmy will eat it all! I love any kind of bread! Ha! Cheesy bread probably best. Definitely forwarding this to my friends that are obsessed with Nutella! I love nutella (usually the real food version or make it myself) Yum! These look divine! A good roll is the best recipe to have in the arsenal! These look so good! Oh wow. I bet my boys would love this! Trying to kill me with this deliciousness? Love these. I love Donna. She is just the sweetest person, with the most fun sense of humour. I heart her. These rolls are amazing. Those rolls look fantastic! Thanks so much for doing this! Woot! WOot! I hope you enjoy the book! i love cinnamon rasin bread. These remind me of my Nana's chocolate rolls and since I love nutella so much, I must try very soon! I love Pumpernickel bread the most!